Thank you cathay for the movie treat! We caught the Hunger games : catching fire on its premiere preview and personally felt that it was good. 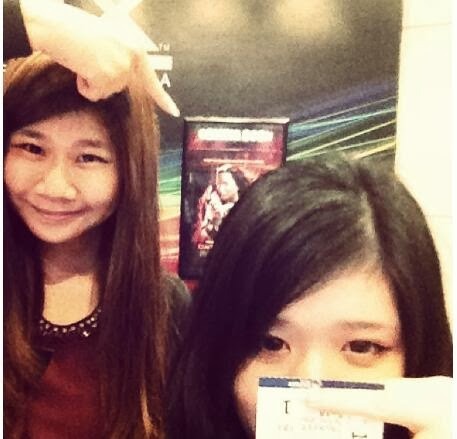 Brought Fenny along for the movie , together with the other CNOS bloggers. The storyline reflects a lot about life, especially how all of us are trying to survive in the society. The rich and the poor, the fear in people and how every one of us are controlled by our government, all over the world. The movie setting remains the same as the first sequel, adding on more high technology effects and as the sound effects fits in. I still prefer the soundtracks of the first sequel though! In the second sequel of hunger games, the movie put much focus on the introduction where they explain the lifes of the Victors after the games and how they live in pressure. The story then continue to show the changes of events and then to the games. Unlike the first sequel, very little time was on the arena. In fact,the game was stopped half way. There was a twist of events which was stopped halfway and to be continued in the next movie sequel.When I saw the ending, I went like ARGH WHY. to OKAY WHEN IT THE NEXT PART COMING OUT! In conclusion, the movie has succeed to make me look forward to the next sequel and I guess higher expectations too. For now, I shall just read the sequel to quench my curiosity.